A cluttered home is a major source of stress for many people. It is stressful to look for items you need in a messy home. It is difficult for children to learn to put things away properly. It is next to impossible to have guests in a cluttered home. People are too embarrassed to have friends over at short notice. Declutter your home and reap the benefits of a neater, more manageable living space. The same principle can be applied to your life. 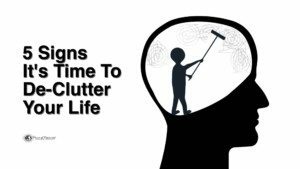 Declutter life by removing people and activities that only cause stress and headaches. Having a more streamlined life will reduce stress and make you feel better about yourself. It pays to make small changes that add up over time. Here are 7 ways to declutter your home and life. In your home office or in your workplace, your desk is a great place to start in your decluttering quest. Clear off the surfaces and put everything in piles based on its importance. File all of the important documents in a filing cabinet or drawer. When new items come in, do not put them on your desk. Deal with them as quickly as possible and either put them away or recycle them. If you keep your desk neat with only a few personal mementos along with your workday essentials, you will feel more productive and relaxed. One of the best ways to declutter your home is to make sure you have enough storage space in the kitchen. If you don’t, consider getting rid of the items that do not fit in drawers or cabinets. This leaves attractive counter space with enough room to prepare food and keep essential kitchen appliances. It’s also important to go through your refrigerator and make sure everything in it is edible. This will reduce your stress when you are preparing a meal. When you declutter home, move to the bedroom. This has two important features: first, go through all of your clothing and linens and make sure you only have what you need. Donating any items that you have not used in a year is a good policy. Organize your closet so that you can hang things neatly. When you declutter your home, you will be able to use what you do have in a better way. Next, clear off all of your surfaces and the floor. Dirty laundry should be kept in a hamper and washed regularly. Having an organized bedroom is more restful for sleep, and will give you a better start on every day. Everyone has unused prescriptions and over-the-counter medications clogging up their medicine cabinets. Take these drugs to authorized drug take-back days or dispose of them properly. Go through your household collections of personal care products and throw out all outdated bottles or those you have not used in six months. Use online banking to its fullest and eliminate the monthly hassle of paying bills. When you automate your bill payments, you don’t have to worry about mailing in checks on time. Doing all your banking online also reduces the amount of paperwork you need to deal with, bringing you a neater work space. Go through your credit report and make sure there are no errors. Decluttering your financial life will give you as many benefits as decluttering your home and office. Another great way to declutter your home includes getting rid of digital mess. Spend an afternoon cleaning off your phone. Get rid of apps and programs you never use. Set up cloud backups for your important information like photos. Work on getting off all the email lists you don’t use anymore. This can include catalog emails, notifications from social media sites, and news emails. It may seem cruel, but decluttering your life includes saying goodbye to people and situations that only cause you stress. It may not be possible to cut yourself off from all sources of stress, but your enjoyment of life will be increased when you let go. When you declutter home, it may seem like a huge task. It may be so overwhelming that you don’t know where to start. You can make small, positive changes to reach your goal. Start by decluttering just fifteen minutes a day. This will increase your satisfaction with your life and free you to have new experiences. When you remove the excess from your life, you will live with less stress and be happier overall.